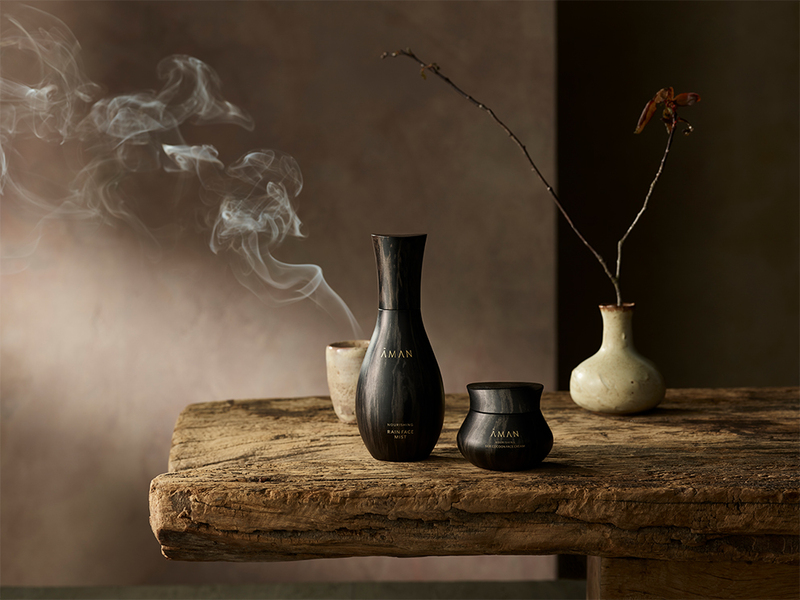 The new skincare collection – which includes hydrating face creams and serums, nourishing face masks, upliCing body oils, calming milk baths and pulse-point remedies – represents the spirit of Aman in a bottle, oﬀering a soothing journey to a place of beautifully scented repose and respite from the everyday grind. 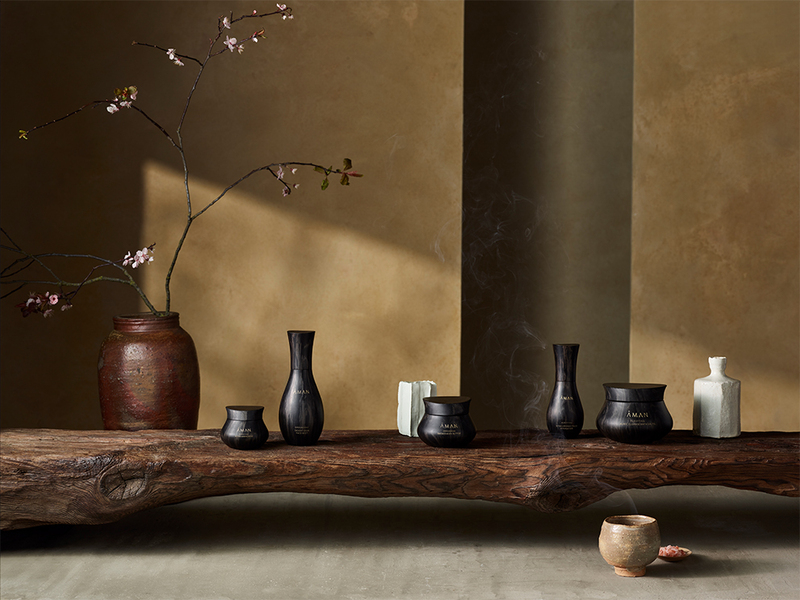 The sense of peace, the intrinsic connection with its beguiling locations, and the becalming architecture for which Aman is so renowned, deﬁne the design aesthetic for the collection’s bottles and jars. 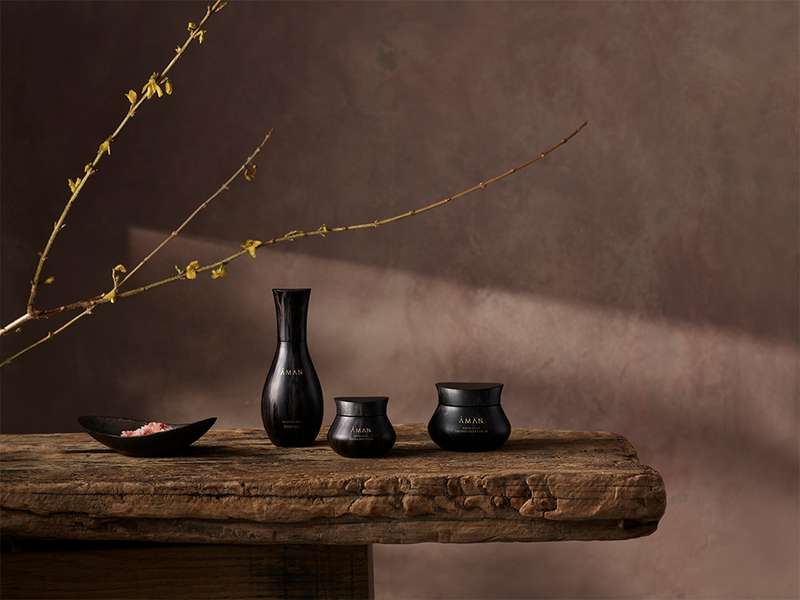 Acclaimed architect Kengo Kuma masterfully blended these attributes with Aman’s Eastern roots and channelled them into striking vessels, a beautifully craCed reimagining of Japanese porcelain. For more than 30 years, Aman has created an opportunity for guests to cast aside quotidian distractions and explore the possibilities of a better, more wholly nourished self from a place of serenity. From jungle to desert, countryside to city, Aman welcomes its guests into a comforting and holistic space to connect body and mind. 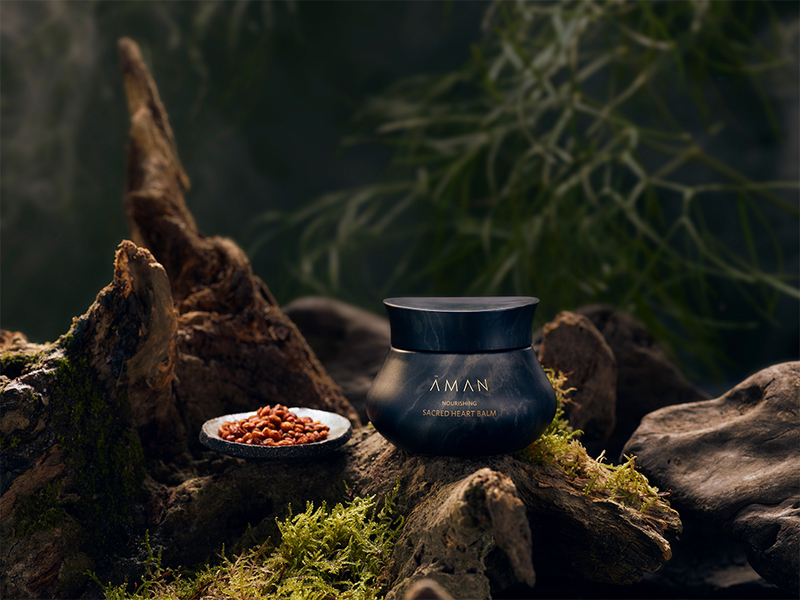 The new Aman Skincare collection inspires a similar journey following the three distinct pathways that harness the natural settings of Aman’s locations: mountains and deserts, Grounding and earthy in their essence; oceans and seas – fresh, Purifying and ﬂuid; nature, forests and lush greenery – Nourishing and renewing in the energy they oﬀer. The brand-bespoke formulations have been consciously conceived in alignment with nature, to ground, purify and nourish. 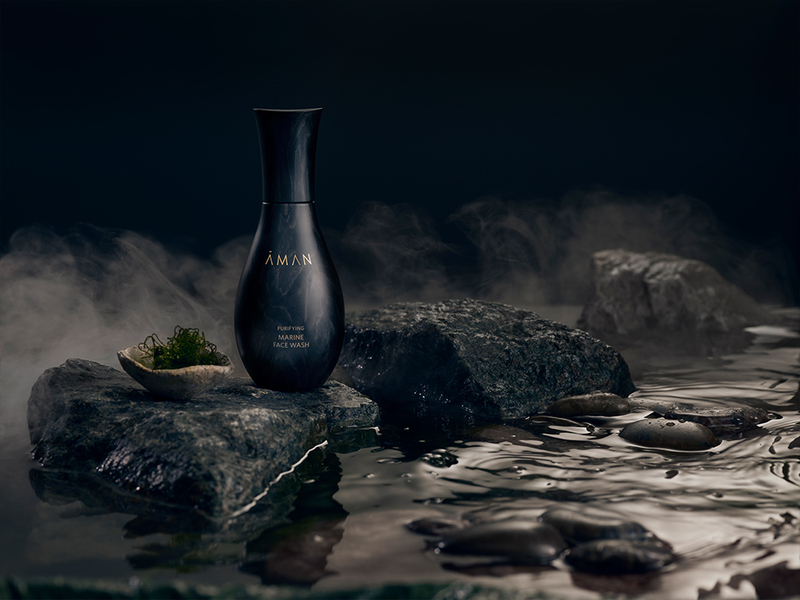 The collection of 30 products was formulated to address speciﬁc physical and emotional needs, whilst reﬂecting the unique and varied landscapes found in Aman’s locations: deserts; rainforests; lagoons and oceans. Many of the ingredients are sourced from and inspired by Aman destinations, from Bhutan to Morocco and from Venice to India. The word Aman means “peace” in Sanskrit. Aman has elevated the idea of the resort as a sanctuary of peace to an apogee of healing and calm, oﬀering a naturally inspired holistic approach to wellbeing. It has approached creating skincare with the same rigour, values and integrity as it does running its sanctuaries: with much meticulousness, supremely high standards and the greatest respect for the bounties of the natural world. 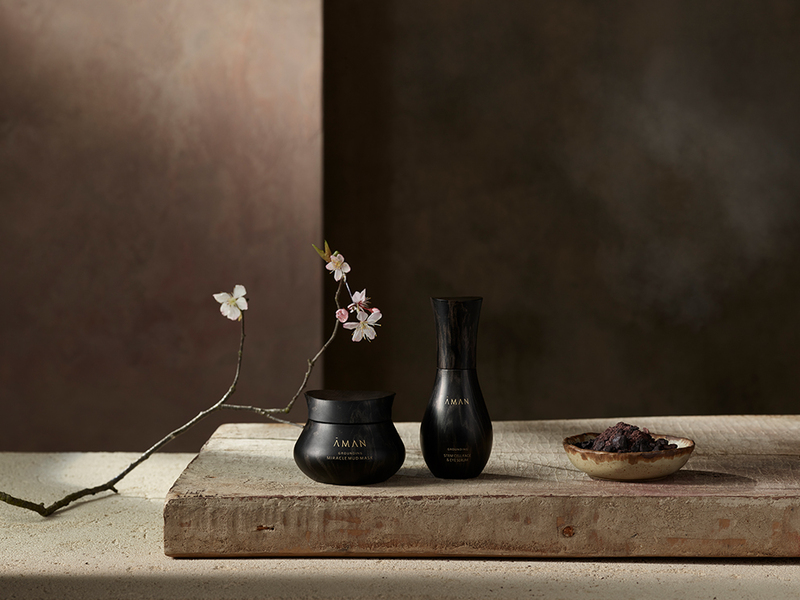 The Aman Skincare collection is informed by ancient wellness traditions and speciﬁcally formulated to combine the treasures of the Earth with truly transformative eﬃcacy. The precious ingredients utilised include pearls, homeopathic metals, healing tree oils, amethyst, jade, frankincense and palo santo, in addition to alkalising, oxygen-rich spring water, wild-harvested Amazon butters and rainforest muds. 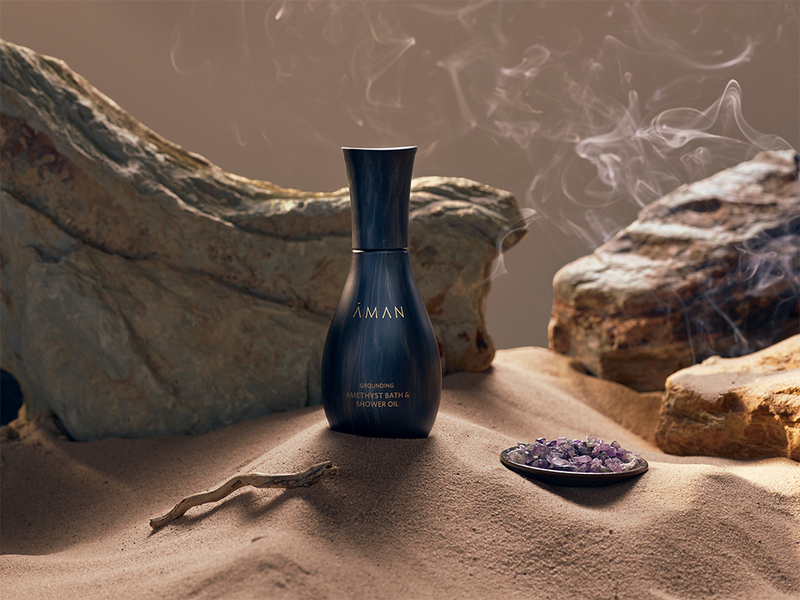 Sandalwood, a precious, healing oil with a soC, embracing aroma, is the unifying ingredient found throughout the Aman Skincare collection. It has been used for centuries in the Ayurvedic system of medicine thanks to its ability to help calm, soothe and centre. Earth. 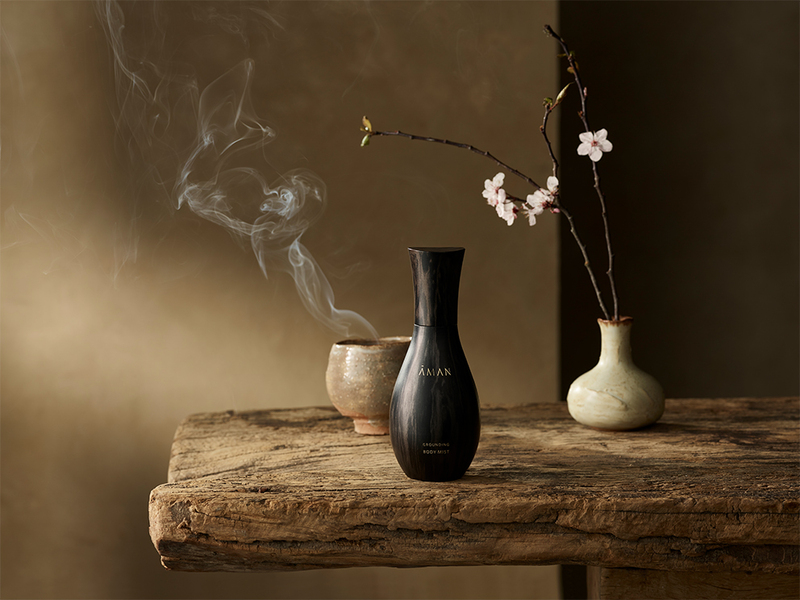 This capsule collection provides a healing balm with a profound aromatherapeutic eﬀect for both body and soul. Ingredients such as amber oil help to relax the brainwaves while sandalwood assists in calming the nervous system. Other ingredients include hyaluronic acid, argan stem cells, rose, maca, silver and amethyst. These refreshing preparations have been speciﬁcally designed to upliC, invigorate and reenergise. Ingredients include algae, pearl powder, lilac stem cells, colloidal copper, seaweed and marine extracts to eﬀect a deep, enlivening cleanse, which also soothes and rejuvenates. These healing formulations have been speciﬁcally designed to cosset and nurture skin and soul alike. They are intended as a nourishing ritual for body and mind, enriched with indulgent and hydrating aromatic balms and creams. Ingredients include jade, gold, honey, sea buckthorn, rosehip and silk – the very ﬁnest, most precious treatments that nature has to oﬀer. 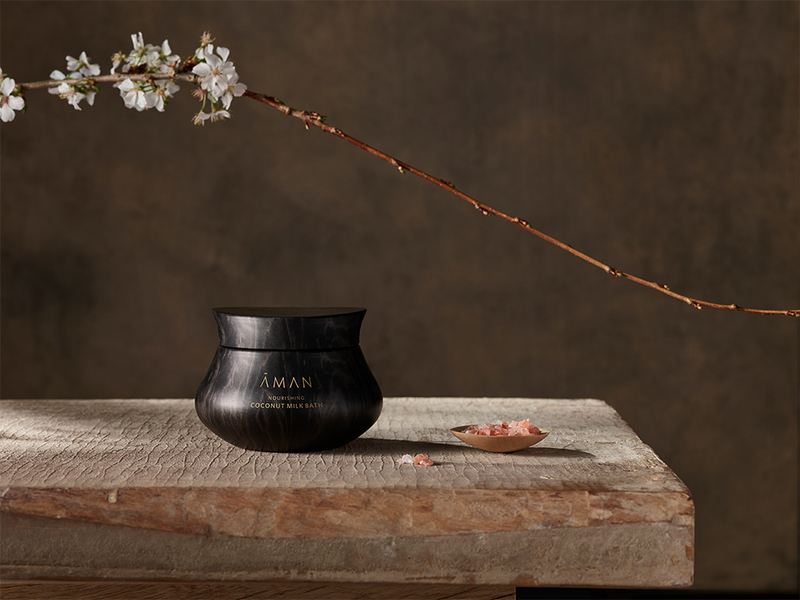 Alongside the unveiling of this collection of skincare, at each of its resorts Aman has created a new menu of spa treatments that utilise the products and complement the existing spa treatments which are inﬂuenced by local holistic traditions. 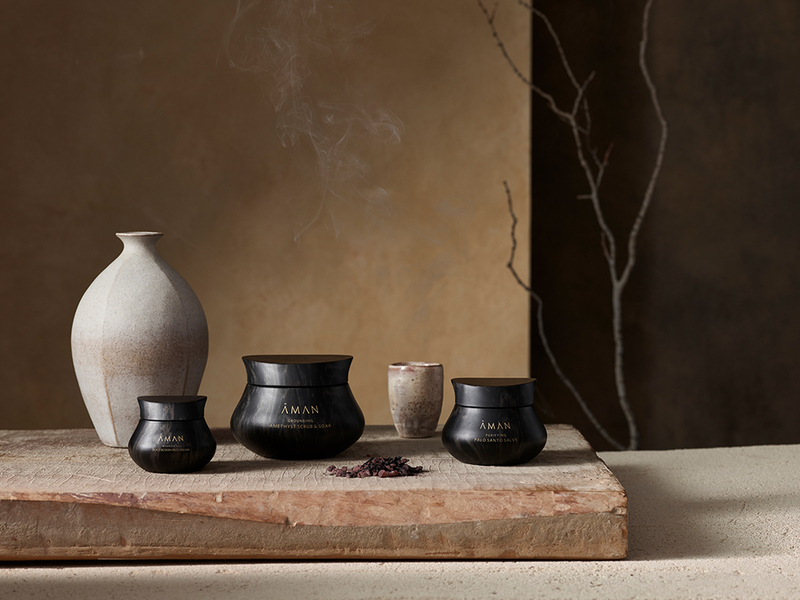 The Aman Spa Signature Menu is available at every Aman, and reﬂects the Grounding, Purifying and Nourishing pathways. There are four treatments available within each pathway: Massage, Body Polish & Wrap, Face Ritual and Journey, the last of which includes all three aforementioned treatments and which is designed to amplify their eﬀects. Each treatment is tailored to the individual to target speciﬁc concerns and help attain personal wellness goals. The ethereal Aman spirit, which instils a sense of peace and belonging and provides a home away from home has come full circle: now, you can ﬁnally bring Aman home. Wow this sounds lovely. 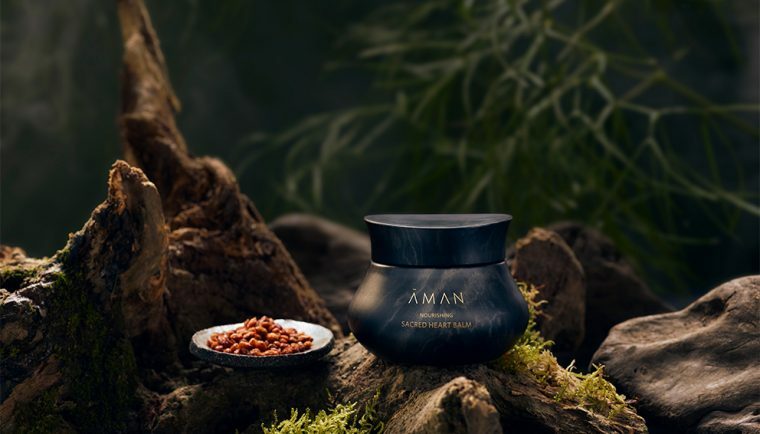 I know that Aman resorts are the epitome of luxurious travel and I’m sure their skincare line will live up to the highest standards as well. I’m hearing about this brand for the first time. The base concept behind the brand sounds very good and very well thought off. Wow, the products look amazing. I so want to grab them, wish they were available for sale on other websites too. Till now I just knew of the Aman resorts and their launching exclusive skincare fascinates me a lot. These images are quite amazing and I’m sure so are their products. I have never heard about Aman brand but the way you have written about them has allures me to head there. Wellness and holistic approach always have been my priority. Have never heard about this brand but it sounds interesting. And really looking forward to try out the products. Thanks for such a detailed article on the same. I am sure like Aman chain of hotels and resort their beauty products are going to take market by storm. The signature spa therapy looks indulgent and worth every buck.